According to Wikipedia, a monolith is a geographical feature such as a mountain, or a single piece of rock placed on, or within, a monument. A monumental monolithic is a structure or sculpture, which has been excavated, or carved as a unit from surrounding matrix of outcropping of rock. 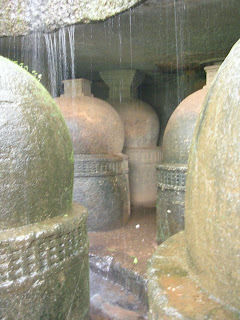 Many of us know about Europe’s Stonehenge, the giant monoliths of the Iron Age, but perhaps don’t know about the monoliths of India. 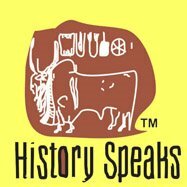 Monolith as an idea is as old as the early Mauryan time in Indian history. It was during the time of Emperor Ashoka, the idea of the monolithic evolved in three distinct forms – free standing pillars, rock-cut caves, and rock-cut sculptures. 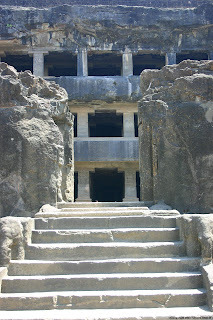 Barabar caves carved out in a granite spur near Gaya are the earliest representations of monolithic caves in India. 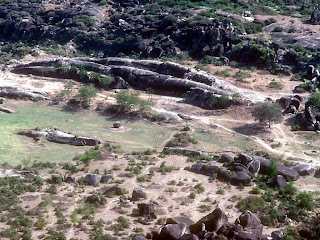 These hills (spurs) are famous for the four rock-cut caves, excavated during the reign of Emperor Ashoka, for the Ajivikas. Carved out of rock, these caves look as if they are cut with a laser. 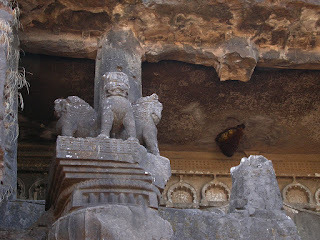 Out of the four caves, the most significant one is the Lomas Rishi cave. The façade of Lomas Rishi cave has been based on the architecture of a thatched hut, which used to house ascetics in the ancient period. 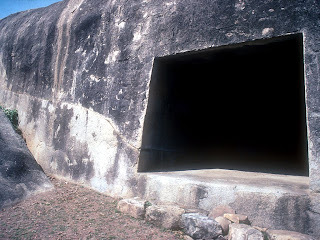 The interior of the cave consists of a big rectangular chamber. 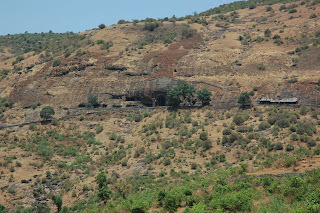 The nearby Nagarjun hill also consists of two caves, namely Sudama and Chaupar. 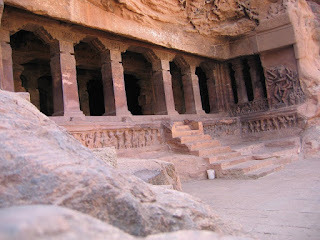 Founded by Ashoka’s grandson, these caves boast of polished interiors, but plain exteriors. In the 9th year of Ashoka’s rule, the Emperor fought the battle of Kalinga. However, horrified by the terror of the war the Emperor found him in deep grief; adopted Buddhism and became the most celebrated ideal king, the country has ever produced. On the spot where the battle was fought he carved out an unfinished (forepart) elephant resembling Lord Buddha coming out from his mother’s womb. Underneath the elephant he engraved his message of dhamma in fourteen edicts. The spot is located just outside Bhubaneswar in modern Orissa at Dhauli. 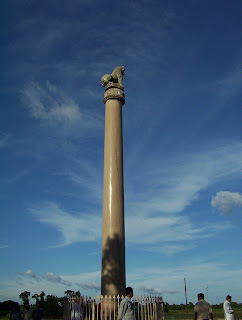 After the battle, Ashoka also erected polished monolithic pillars with lion tops through out his empire, especially in places like Saranath, and Lauriya Nandangarh. 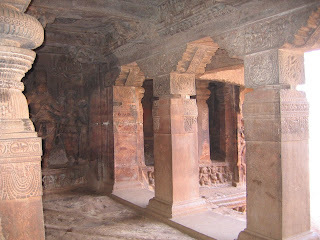 The pillars even today shine like mirror; were carved out from live sandstone, specially brought from Chunnar, a place near Varanasi in UP-Bihar border. Following Ashoka, India was ruled by two most powerful dynasties – Sunga in North India and Satavahana in Deccan. Buddhism flourished with full boom all over the Subcontinent. 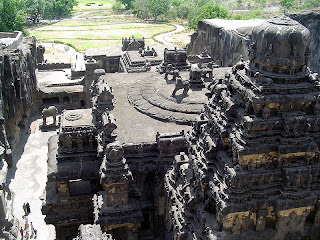 During this period, the idea of monolithic was spread to region like Western Maharashtra, where in the lap of the Sahayadri hills, Buddhist monks with patronage received from the Satavahana Kings and merchants scooped out live basalt rocks to produce beautiful viharas, stupas and chaityagrihas. 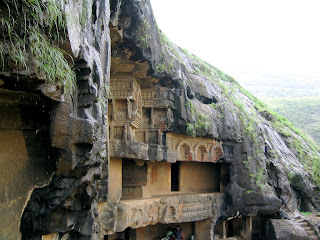 Some of the places where caves were excavated are Karle, Bhaja, Kondane, Junnar, Nasik and Pitolkhora. 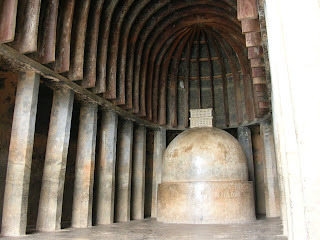 Of these earliest caves, the most extensive is of Bhaja, where one very large apsidal plan worship hall (a chaitya) enshrines a stupa. 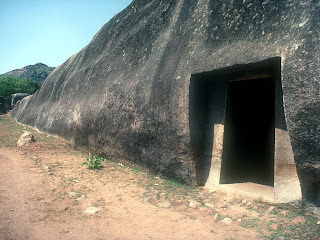 Unlike the earlier sanctuaries of the Barabar hills, which were excavated from bottom up (as the incomplete Lomas Rishi cave indicates) these caves were excavated top down. Beside the large worship hall, many resident halls for monks (viharas) line the cliff. In subsequent period, a great many more rock-cut monasteries were excavated. Prominent among these is the site of Karle, dating to the late 1st century BC. Its immense worship hall flanked by monastic dwellings repeat the pattern of Bhaja – indeed a pattern of all rock-cut sites of the Deccan – but certain changes are apparent. For example, the pillars of worship hall no longer slope inwards, and they are decorated with post-shaped bases and capitals that depict riders on elephants. The doorways are flanked by relief sculptures representing amorous couples (mithunas). 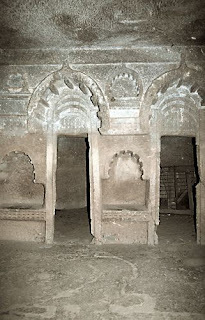 Some rock-cut sanctuaries date from even later than Karle, such as Kanheri in the suburbs of Mumbai. 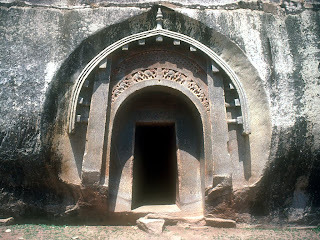 In the east coast also a large number of caves were excavated for the Buddhist monks in Orissa and Andhra Pradesh in places like Langudi, Pandavula (East Godavari), Kodavali, Vijayawada and so on. In Gujarat, Junagarh was yet another important bastion of Ancient India, which also has preserved a rock-cut Buddhist cave along with Asokan edicts. Excavation of monolithic caves was in peak during the rule of the Vakatakas in the 5th century AD. 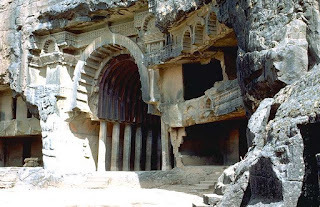 At Ajanta, we find the best examples of rock-cut caves in Deccan, where thirty caves were cut into steep and curving basaltic scrap – all within the short period between 462 and 480. 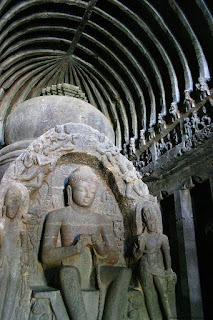 The caves of Ajanta belonged to the Buddhists. However, near Sanchi in Madhya Pradesh the Hindus under the patronage of the Guptas also achieved excellence in rock-cut architecture; the remains are found at Udayagiri (dated 401-02 AD). Some classic Gupta remains of Udyagiri include an enormous relief image of the God Vishnu in his form as the great boar Varaha rescuing the earth from the waters, an image of Ganesha and an image of Durga killing the buffalo demon. 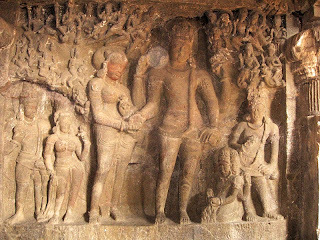 In South-Western Deccan, the idea of rock-cut caves emerged during the rule of the Chalukyas (543-757 AD). 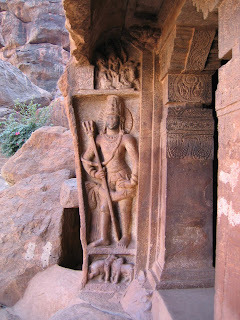 At Badami, the capital of Chalukya, four rock-cut caves were excavated dedicated to Hinduism. 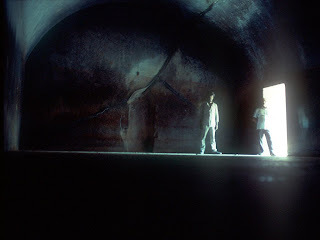 The caves were excavated as large pillared halls before a very much smaller sanctum. 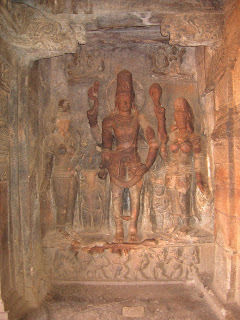 The sculptures depict God Vishnu and his various manifestations, Lord Shiva and Goddess Parvati. In South India, the Pallava dynasty had long been in authority, however only in the seventh century, King Mahendravarman (C. 600 – 630), patronized for the extensive rock-cut work at the seaport city of Mammalapuram. Besides the excellent sculptural panel of ‘Descent of the Ganga’ in relief, Mahendra’s other best known rock-cut works are pancha ratha temples showing the foundation of the highly evolved later South India temples. The temples are known for their varied hut-like and barrel vaulted roofs and pyramidal storied towers. The Pallavas also excavated beautiful carved temples, the interior of which are adorned with panels, the most famous being the sculpture of Goddess Durga riding a lion as she moved the buffalo demon, Mahindra. 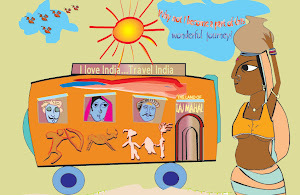 Contemporary to Pallavas were the Kalachuries who ruled in Mahrashtra. The Kalachuries carried forward the earlier rock-cut tradition leaving their most remarkable legacy at the world heritage site of Ellora. 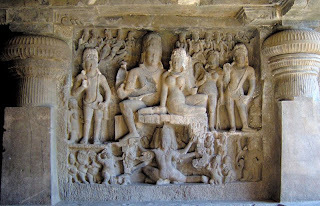 Indeed, the caves of Ellora belonged to all three faiths – Hindu, Buddhist and Jain. However, the most remarkable is the Kailash temple, a Dravida style temple, cut dramatically out of the cliff and extending nearly 90 m from the front to back. 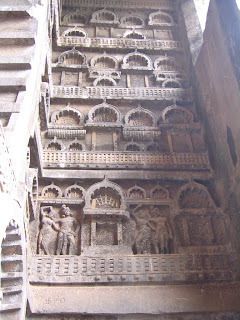 It is raised on a high base with roiling animals and walls are carved with beautiful sculptures. The Kalachuries were also credited for the work of Elephenta near Mumbai. The last but not the least of the monoliths in India is found at the crest of Vindhyagiri, Shravangelgola in Karnataka – a thousand year old gigantic 17.38 metre high monolithic image of Bhagavan Gometeshwara Bahubali. It is considered to be the world’s tallest monolithic statue.